Welcome to the first Splatfest of 2018. Splatoon 2 will keep giving us Splatfests for about one and a half more years. 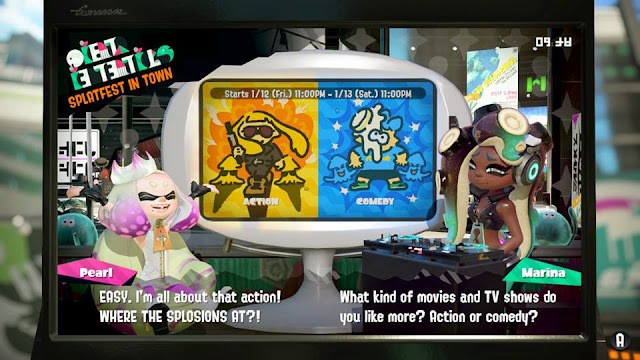 What exciting topic will Pearl and Marina bring us for the WORLDWIDE (instead of regional) Splatfest beginning this weekend? ACTION VERSUS COMEDY, in a movies and TV shows sense. On that note, that sort of segues into my decision. Let me be clear: I don't even watch movies or TV shows. My lack of knowledge of what even goes on television is why this website is called KoopaTV, even though it's primarily made up of text-based content. That said, my favourite show, ever, that I basically base my life around, is Seinfeld. Obviously, that's a firm comedy show. Meanwhile, I have no strong opinions about any action show or movie. I mentioned Seinfeld in the Sci-Fi vs. Fantasy article and embedded the “fantasy camp” line. If Seinfeld is Fantasy (good), then The Big Bang Theory is Sci-Fi (bad). Unfortunately, comedy these days is driven by the likes of The Big Bang Theory, not Seinfeld. The Big Bang Theory is considered a comedy leader, to the point where of all the comedies made in the 2000s, it is one of the few mentioned on Wikipedia's sitcom page. It's still on the air and getting new seasons. It's getting MORE popular over time. Let's reference those laugh tracks Pearl talked about. I am going to embed another clip from The Big Bang Theory below. You do not have to watch it. 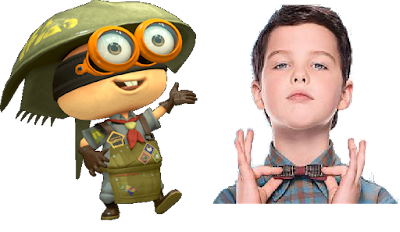 It does not have the character named Sheldon, but rather, his friends. Besides the inaccuracies contained in the video about the “nerdy” subject matter (Donkey Kong isn't into princess-stealing and Mario isn't Italian. To their credit, the dude correctly identified Mario as a plumber which some people can't do nowadays — though he wasn't a plumber at the time of the incident referenced, so it's a moot point), it just is not funny. The laugh tracks are spammed and don't even vary from one use to another. Seinfeld had laugh tracks... from the live studio audience. They laughed with you. They didn't try to tell you when to laugh or force one. Can you blame me for not watching television when this is the crap on it? As Rawk mentioned, The Big Bang Theory's audience is for people who want to make fun of nerds by watching caricatures of them, while also trying to have those people be able to claim they are part of nerd culture. Like whatever the hell Rick & Morty is that is also going on now. (I also mentioned that in the same capacity two months ago, too.) Why would you want to be part of nerd culture? Well, right now you humans have demonised being “normal” and your worth in society is made up of how many “disadvantaged” victim groups you can be a part of. Nerds, traditionally bullied in schools, are one of those groups. 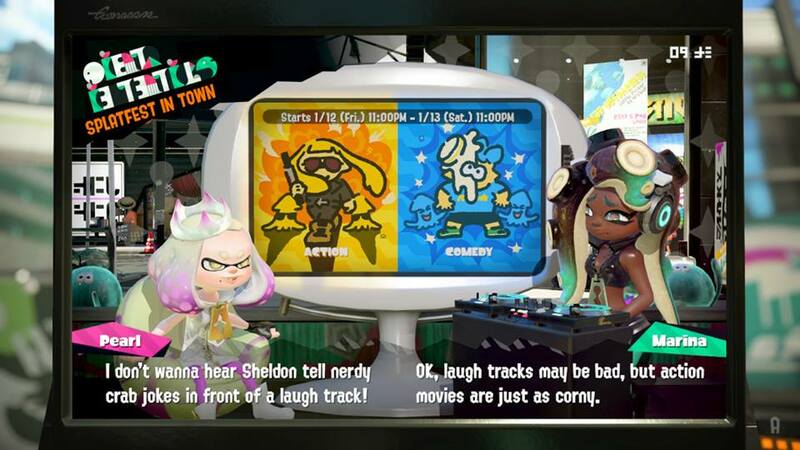 Left: Sheldon, owner of Ammo Knights, the weapons shop in Splatoon 2. Right: Sheldon's child form, freaky nerd kid from The Big Bang Theory spin-off Young Sheldon. For Marina's part, by the way, she failed to make a coherent pro-Comedy argument, or even an anti-Action argument. She basically said action movies are cliché and samey. That just means they are all middle-of-the-road, instead of ranging from bloody amazing (Seinfeld) to gutter trash (Big Bang Theory). Unfortunately, it looks like Marina still hasn't learned the lessons from my article directed at her. Having failed to refute Pearl's argument, I have to side with Pearl and be part of Team Action. Besides, does Marina have any self-awareness? She's talking in an action game sequel that is PRETTY DANG SAMEY to the first one. And, hey, it's great. Marina's presence is self-defeating, so I look forward to destroying her team of crappy excuses for comedians this Saturday. If Pearl didn't remind Ludwig that The Big Bang Theory is a part of the comedy genre, this article would turn out very differently and he probably would have joined Team Comedy. After all, KoopaTV is a site built on LEVITY, and gives annual awards based on humour! Check out which article won the Most Humourous KoopaTV Article of 2017 here. It's more funny than anything in The Big Bang Theory, anyway. What are your thoughts on Action vs. Comedy? The next Splatfest is a rerun, but at least it's philosophical and not having to do with the entertainment industry. Your comment doesn't add to the discussion no matter how many times you repeat it, Mr. Anonymous. I'm actually tempted to give you a truth point for that. If you look, I already gave it to you. It's hard to miss if you look at the dedicated page explaining the KoopaTV Loyalty Rewards Program. i typically dont read articles from almost 3 years ago. ...It's a continually updated page. It even has a change log. If you don't want to read it, go ahead, but you won't be winning any rounds anytime soon if you don't familiarise yourself with wot the program actually is. The Splatfest takes place during THE BABY's birthday. I probably will play up to fiend rank or something. Hey, an hour of free time can get you to Champion! But do I want to be salty on her big day? I dunno, does she know the difference?